Taking part in the Bahrain Tech Week 2018, the MIT Enterprise Forum Pan-Arab held its second ‘Innovation Forum’, organized in partnership with Bahrain Economic Development Board and the support of Internet Society. 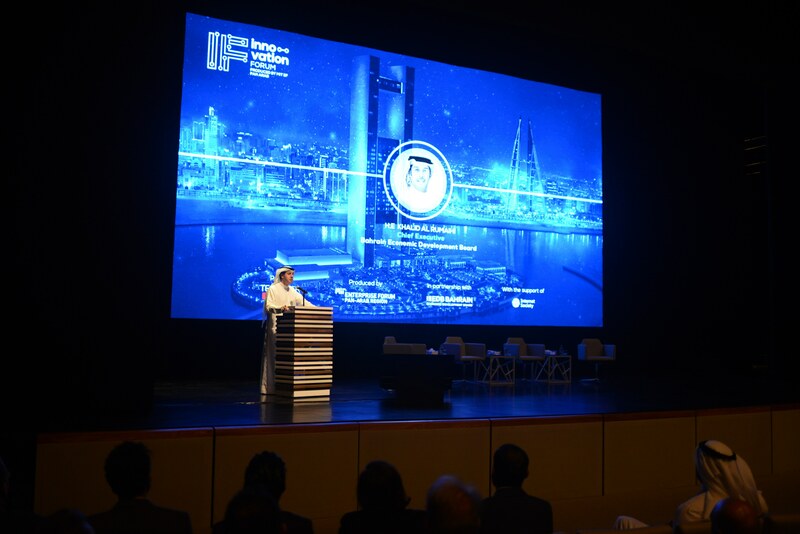 The one-day forum took place at the Bahrain National Theatre, bringing various members of the Bahraini startup ecosystem, whether entrepreneurs, investors, academics, or tech-enthusiasts. Around 300 entrepreneurs, investors, and tech enthusiasts from the Bahraini ecosystem came together to discuss and deliberate on the outlook for the Bahraini tech ecosystem, and what the opportunities and pitfalls facing the quickly developing ecosystem are. To kick off the day, HE Khalid Al-Rumaihi, CE of Bahrain EDB, gave a welcoming speech which highlighted the community’s efforts to put Bahrain on the map as a global hub for innovation, entrepreneurship, business creation, and youth empowerment. Stressing on the importance of becoming a pioneer of innovative ideas in the region, he said: “We need to think of an environment where we create innovation, not just import it.” Following him was also a welcoming speech, given by MITEF’s MD Maya Rahal, who introduced the audience to our work in the region and our involvement within the Bahraini tech ecosystem, and our continuous efforts to create and support entrepreneurs through events, partnerships, programs, and competitions. The first keynote of the day was given by Dr. Mike Nelson from Cloudflare, who shared his vision on tomorrow’s cloud-based Internet where data is king rather than the infrastructure. The main outtakes of his keynote were that policies must focus on “stopping stupid stuff” rather than waiting for them to occur and cause the damage, he also underlined the importance of testing and experimenting in a place such as Bahrain given its size and agility to adapt to change: “Prototype! Prototype! Prototype!”. Lastly, Dr. Nelson explained why he believes the future of the Internet relies on a “network of networks” that is cloud-based, which allows for more secure, efficient, and reliable data exchange protocols that tomorrow’s entrepreneurs can innovate upon and be the next “Batman” as he dubbed it. Also on the agenda was a panel discussion about Industry 4.0, which brought Dr. Khaled Elmufti, Muhammad Qureshi, Arun Bruce, Gary Chandler. The dialogue mainly revolved about how Industry 4.0 has the potential to revolutionize tomorrow’s factory lines, which in turn would cut costs, increase productivity, and achieve a higher level of compliance. Arun Burce of BCG commented that "startups must think less of the tech, and more about the solution they are bringing to the user." To end the day was one last panel discussion on Blockchain and its promise to reinvent traditional economies across the world. Before the conference was announced over, a representative of Tamkeen took the stage to announce that Bahrain will be joining the Global Entrepreneurship Network, and had won the bid to host the Global Entrepreneurship Congress for 2019. The day was marked by a series of networking sessions which allowed attendees to mingle and network in a very laid back environment, where they exchanged knowledge, opinions, and (most importantly) business cards. The future seems bright for Bahrain’s tech ecosystem, specifically with all the support and exposure that entrepreneurs have been receiving from the government and supporting entities. Innovation Forum is one among many events taking place in the kingdom that aim to give access to entrepreneurs to world-class speakers, thought leaders, policy makers, and tech innovators. The MIT Enterprise Forum Pan-Arab is looking forward to hosting yet another forum next year, with the support of partners and the Bahraini startup community.